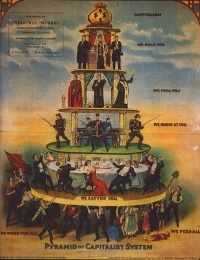 This page Social class is part of the politics series. Social class refers to the hierarchical distinctions between individuals or groups in societies or cultures. Anthropologists, historians and sociologists identify class as universal, although what determines class varies widely from one society to another. Even within a society, different people or groups may have very different ideas about what makes one "high" or "low" in the hierarchy. The most basic class distinction between the two groups is between the powerful and the powerless. Social classes with more power usually subordinate classes with less power, while attempting to cement their own power positions in society. Social classes with a great deal of power are usually viewed as elites, at least within their own societies. In the simplest societies, power is closely linked to the ability to assert one's status through physical strength; thus age, gender, and physical health are often common delineators of class in rudimentary tribes. However, spiritual charisma and religious vision can be at least as important. Also, because different livelihoods are so closely intertwined in simple societies, morality often ensures that the old, the young, the weak, and the sick maintain a relatively equal standard of living despite low class status. Social class in ancient Rome played a major role in the lives of Romans. Ancient Roman society was hierarchical. Free-born adult male Roman citizens were divided into several classes, both by ancestry and by property. There were also several classes of non-citizens with different legal rights, along with slaves, who had no rights, and could be ejected or sold by their master. Unless indicated otherwise, the text in this article is either based on Wikipedia article "Social class" or another language Wikipedia page thereof used under the terms of the GNU Free Documentation License; or on original research by Jahsonic and friends. See Art and Popular Culture's copyright notice.